Our HOPE MS Luggage Tag would make a great MS awareness gift for your walk team or fundraising group. You could also give this item out as Multiple Sclerosis Gift Ideas, or a prize at your MS awareness event. Together, we can help fight for a cure to MS. 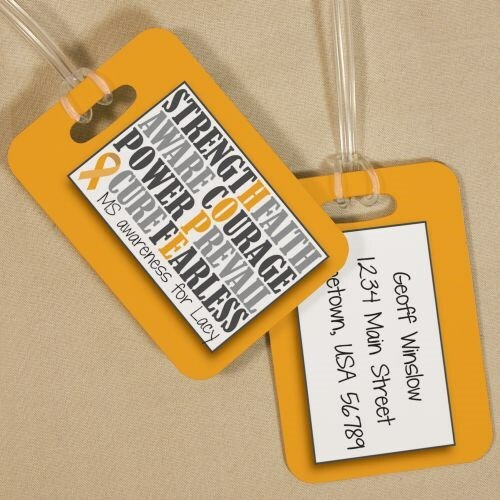 This MS Awareness design is printed on both sides of our single plastic luggage tag and measures 4" h x 2.75" w. It includes a clear elastic loop for easy luggage identification. Free personalization of any name and three line custom message is included. Additional Info People who live and fight MS daily need to have courage and hope to get through the day. This luggage tag, however small, can provide that reminder that they need to help them stay strong. Shop MyWalkGear.com for a variety of MS awareness apparel and gifts.